A WARWICK resident has warned others of postal scams after recieving a "strange" letter from a Czechoslovakian address. Val Parsons said she received a letter with her name on it, saying she'd won big. 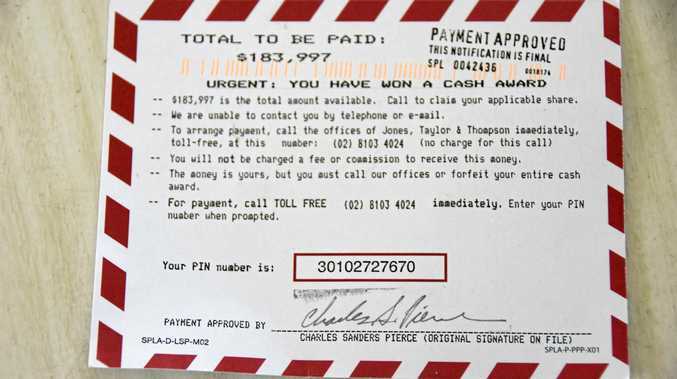 "It was from a group called Jones, Taylor and Thompson and on the other side of the letter is said I was set to receive a total of $189,993," she said. "And I thought, oh boy, I could do a lot with that." The Cleary St resident said there was a number to call to obtain the prize, and out of interest she gave it a ring. "There was a Sydney number on the card, and it said it there no charge for this call," she said. "I thought this all sounds a bit daft, so I gave the number a call out of interest. "The lady that answered the phone said, 'Thank you and congratulations, as a prize for returning this call you have also won a pearl necklace and a stone clasp, which is valued at $400, and you all you have to do to claim your prize is send $29 to an address in Hong Kong'. "Well I wasn't going to do that." Mrs Parsons said all those who received similar letters should be extremely skeptical of their origin. "The letter is from Czechoslovakia and I thought, well that's a bit strange... Prague is long way away," she said. "And I thought there might be some elderly people who might send the money... and they could wake up in the morning left only with the sleeve they keep their bank books in."